Home » News » All news » Things are moving forward in the village of Movile! The German landscape planner Jonas Arndt, founding member and chairperson of the churchfortress e. V. Friends of Hundertbücheln-Movile association, was a guest on 3 July, presenting the topic “Fortified churches and their open spaces – impulses from landscape architecture and environmental planning”. In a short introductory lecture Jonas Arndt dealt with different approaches to the design of spaces in the surroundings of Transylvania’s fortified churches. The example of Movile and Daia (near Sighișoara) played a central role in the presentation, as the association is particularly active in both communities. 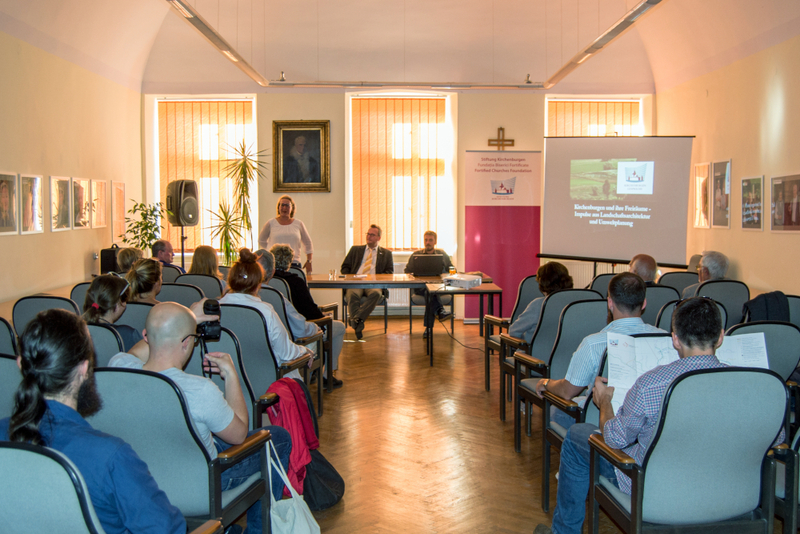 Within the framework of the AFCP project of the American Ambassador, which is conducted by the Fortified Churches Foundation for the period 2016-2018, the association prepared a landscape analysis on the macro, meso and micro levels for these villages and developed some approaches to the possible uses of the various open spaces. After a first stay in Transylvania in 2015, the group of landscape architects from several European countries decided to focus their efforts on Movile. 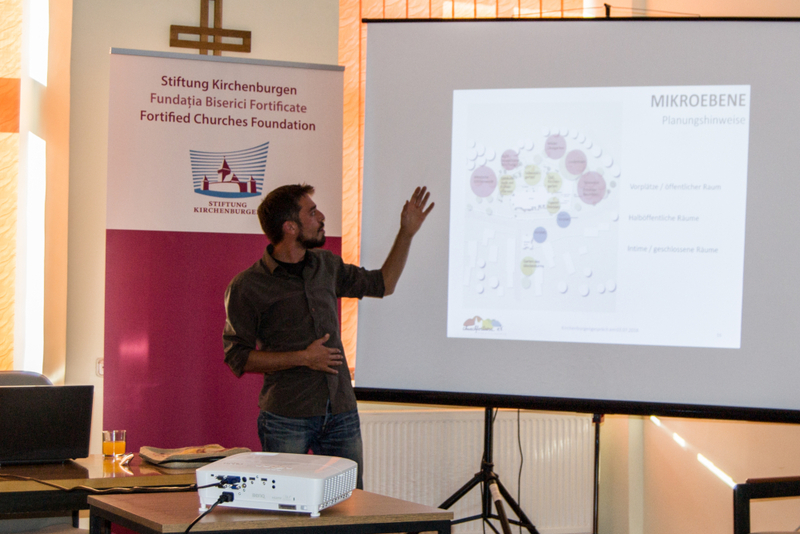 The official foundation of churchfortress e. V. Friends of Hundertbücheln-Movile took place in 2016, approximately at the same time as the Coordination Office for Fortified Churches was transformed into the Fortified Churches Foundation, with which Jonas Arndts association has worked closely from the very beginning. The cooperation with the emigrated Saxon hometown community of Movile is just as fruitful. Today, the association not only carries out analyses and expert reports on spatial planning issues in several villages, but is also specifically involved in individual projects that are mainly concerned with the socio-economic aspect of landscape architecture. For example, initiatives for the distribution of water buffaloes and “Mangalitza wool pigs” have been launched. A comeback of the “Baassner pig” is also being worked on. In the last two years not only the vegetation at the fortified church itself has been brought under control, but above all the bacon tower and parts of the curtain wall have been secured. 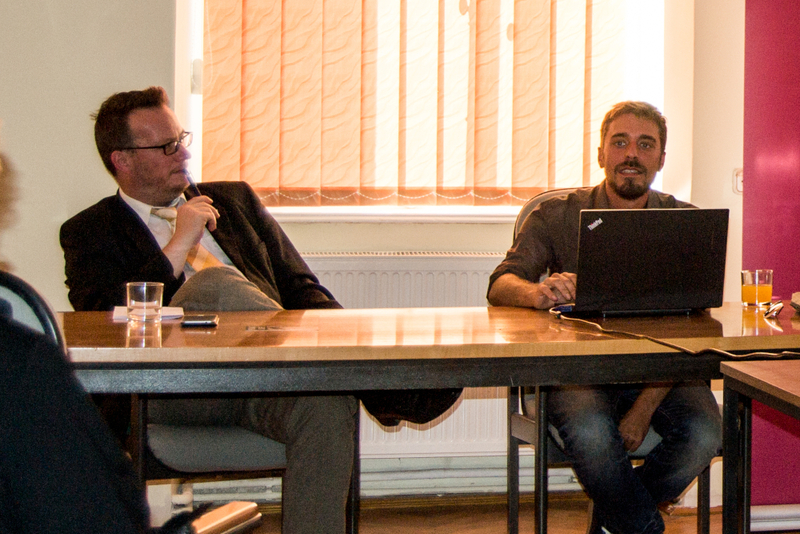 In the lively debate after the lecture – moderated by Stefan Bichler – problems of ownership were discussed as well as social and cultural challenges or questions of cooperation with the local administration and with the associations of community members emigrating to Germany. The Fortified Churches Foundation is very pleased about the fruitful cooperation with the partner in Movile and is happy to support the projects of the efficient group, since, in addition to the strong and regular commitment of the association members, the long-term approaches to village development and the creative ideas for future projects are convincing.